With autumn in full swing, October is a month of chilly mornings, dark nights and Halloween! Remember that the clocks go back at the end of the month, so make sure you spend as much time as you can gardening in the sun because it will start getting darker a lot earlier soon. Make sure you harvest your pumpkins and squashes in time to make Jack o’ Lanterns for Halloween; any that are left over can be used to make some delicious pumpkin soup. You will also need to collect any indoor tomatoes that are left and place them in a drawer or shoebox to complete their ripening, ensuring that you regularly check on them. Early leeks can be harvested now because they are less resilient to the cold than other crops and maincrop potatoes must be got out of the ground before the end of the month with care, making sure you do not damage the tubers. Harvest the last of the peas and runner beans for the year and keep harvesting chard, spinach, carrots, celeriac, lettuce and Oriental vegetables. Finally, lift and store any Florence fennel bulbs before they become damaged by the cold weather and frost. Sow winter lettuce as well as some winter resistant peas and broad beans towards the end of the month to ensure you get and early crop next spring. During October, plant out spring cabbage, overwintering types of onion and garlic and rhubarb crowns. Rough dig over heavy ground and leave it in lumps or ridges that can be broken down gradually by frost and rain. Keep off the soil if it is wet and do not dig it if it is frozen. If your soil is frozen hard it is a good idea to cover it with manure or compost. 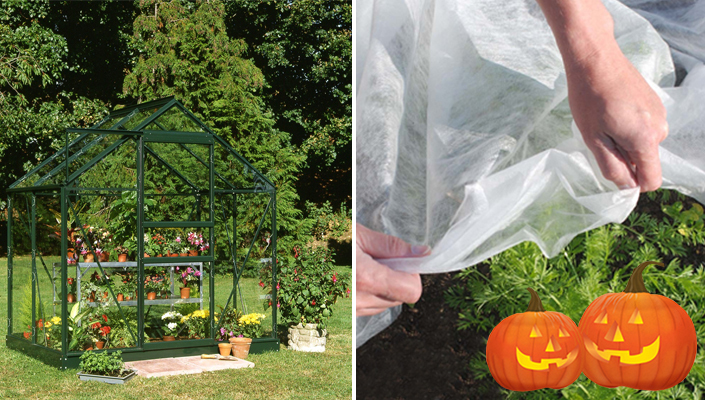 To protect your more tender plants that are in a greenhouse, cover them using horticultural fleeces or plastic bubble sheets; you could also use several layers of bubble wrap as a substitute when frost is forecasted. Any plant pots should be wrapped up in bubble wrap to insulate their roots. With the last couple of winters being extremely harsh, be prepared this year to protect chard plants, spinach, winter lettuce, peas, broad beans and any other crops from the worst of the winter weather. Ensure you have some fleece, plastic or cloches at hand for when they are required. With the plots of crops that have been harvested, make sure that they are clear and clean and take down the runner bean poles, ensuring all soil has be cleaned off the bottoms before storing them somewhere cool and airy, ready to use next year. Stake and secure Brussels sprouts and sprouting broccoli plant to protect them in strong winds. You can also drag some soil up around the base of the plants to give them some extra support.